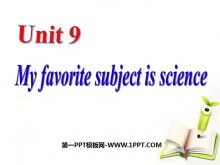 《My favorite subject is science》PPT课件8 我是你唯一的选择 1．Ken and Lindas favourite subject _______ P. E. A. are B. is C. am 2.Whats your favorite_____? Blue. A. pen B. book C. color 3．What _______you do a..
《My favorite subject is science》PPT课件7 Review teacher my subject your A: What is _____ favorite ______? B: My favorite _______ is art. A: Who is _____ art ______? B: My art _____ is Mrs Jones. 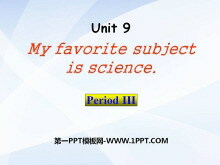 The days of a..
《My favorite subject is science》PPT课件6 Ask and answer in pairs: A: What is your favorite subject? B: My favorite subject is A:When do you have B: We haveon A: Why do you like ? 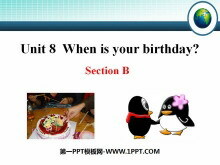 B: Because I think its A: Who..
《My favorite subject is science》PPT课件5 Practice the conversation with your partner. Then make your own conversations. 练习下面的对话。然后与同伴编新对话。 Listen and put the conversation in order. 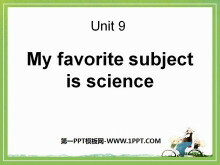 2a听录音..
《My favorite subject is science》PPT课件4 Number these parts of an e-mail message[1-3]. I have P.E. at 1:00. P.E. is fun. Then at 2:00 I have math. It is boring. At 3:00. I have art. It is cool. 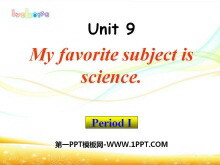 Lets meet on S..
《My favorite subject is science》PPT课件3 Tell your classmates your survey. As favorite subject is Chinese. He likes it because its relaxing. His Chinese teacher is Mr. Wu. Bs favorite subject is history. 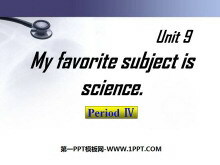 She ..
《My favorite subject is science》PPT课件2 Lets chant: Monday Monday math on Monday. Tuesday Tuesday art on Tuesday! Wednesday Wednesday computers on Wednesday. Thursday Thursday P.E. on Thursday! Friday Friday..
《My favorite subject is science》PPT课件 What fruit do you like best? I like banana. Whats your favorite fruit? My favorite fruit is banana. Whats your favorite subject? My favorite subject is _____. 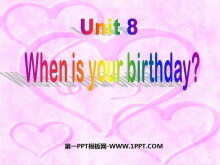 Why do yo..
《When is your birthday?》PPT课件8 Can you read these dates? 1月15日January fifteenth (15th) 4月30日April thirtieth (30th) 7月8日July eighth (8th) 10月1日October first (1st) 5月24日May twenty-fourth (24th) 11月..
《When is your birthday?》PPT课件7 Match the pictures with the events. 1. ______ English test 3. ______ school trip 2. ______ party 4. 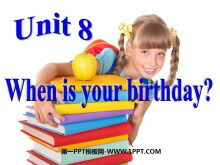 ______ basketball game Read the school notice and list the activities and t..
《When is your birthday?》PPT课件6 Free talk 自由谈论 When is your fathers birthday? His birthday is When is your mothers birthday? Her birthday is When is your friends birthday? 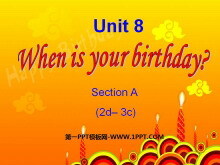 Her/ His birthday is 基变序，有..
《When is your birthday?》PPT课件5 按要求写出正确的单词或词组。 1. month (复数) _______ 2. party (复数) _____ 3. 学校旅行 _____________ 4. 英语聚会 _____________ 5. 这学期 ________ 6. 在下午______________ 7.下..